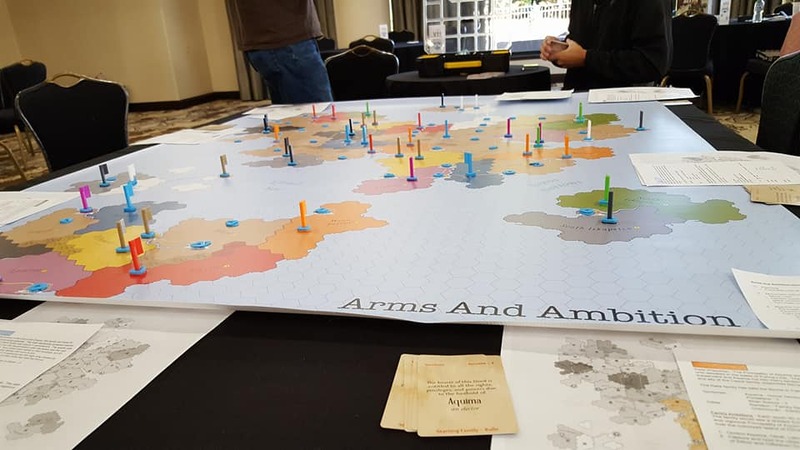 This weekend while attending the MACE convention in Charlotte, I had an opportunity to sit down with Brad Warren and play his new wargame, Arms and Ambition. The game is in development, but very polished so far – a beautiful vinyl mat, 3D printed pieces, and professionally printed cards. Only the rules and documentation are still in developmental mode. In the game, you play one of eight noble families vying for the throne after the ruling dynasty collapses. 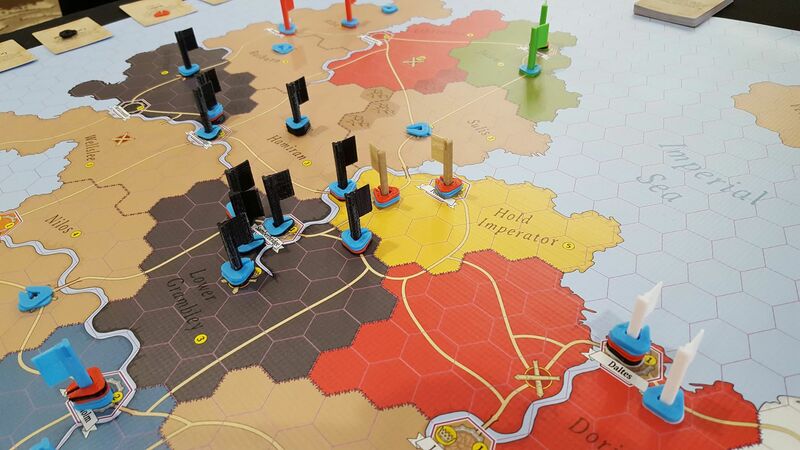 Each family has starting territory and “family ambitions” – victory conditions specific to the player. The overall goal is to gain 100 victory points and declare yourself the new king. You have starting units and each territory you own (represented by a card) has an income value. Game play is very simple. Brad mentioned that you should have it down by turn two and he’s not wrong. It is separated into four phases: Planning, Movement, Resolution, and Resupply. One important note to this planning – if the territory you’re building troops is taken before your resupply phase, those troops are lost! The planning phase is where you build your troops for next turn. You have a certain amount of money (base starting value and extra income in the resupply phase) to buy troops – infantry, cavalry, artillery, warships, and transports. Each unit has their own stats and special abilities. You place the units you’re purchasing on your territory card. Territories are distinct entities from cities, but both can be spawn points. You are limited in the number of units you can spawn by the location’s income. A city with an income of 1 gold can only spawn 1 unit. A large central territory like Tulleries has an income of 5 and can quickly start producing armies. One important note to this planning – if the territory you’re building troops is taken before your resupply phase, those troops are lost! 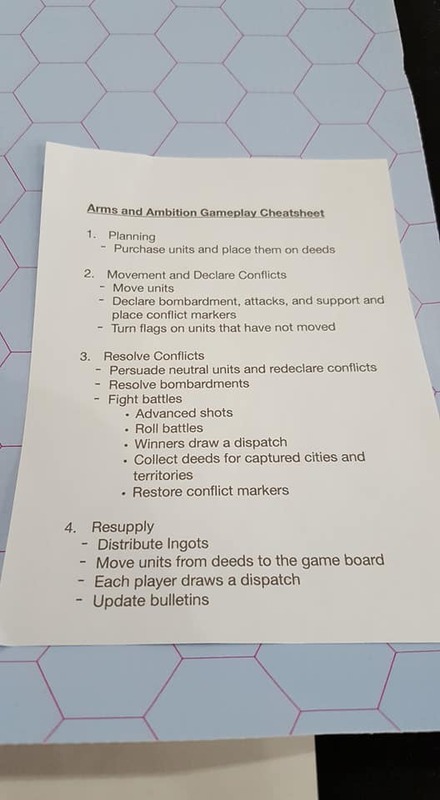 The movement phase is where you move units and declare conflicts. 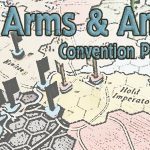 Everything is simultaneous and there is a simple initiative mechanic to break ties if two players are trying to do the same thing. This can also lead to players hanging back certain units to see what others can do. Interestingly enough, this also allows for diplomacy. You can’t hand another player a territory outright, but you can negotiate to remove your units prior to an invading army entering. Since there is no enforced turn-order, this is pretty easy to do realtime. If there is a conflict (a battle or an attempt to persuade neutral units to join your cause), it is a simple matter of taking one of your unit tokens and hanging it vertically on your flag. This allows the entire table to see every action that needs to be resolved in the next phase. The resolution phase is similarly simple. Pick a conflict and go through the resolution steps. Persuasion of neutral units is a simple die roll (getting a bonus if you outnumber them) – if you win, they join the cause. If you lose, then you fight. Battles are very straightforward. Each unit has an attack and defend value, equal to a number of dice. City walls provide a strong defensive bonus. Artillery units get an advance shot ability that takes place before the main battle is joined. Once dice are rolled, arrange them highest to lowest and compare. High die wins, ties are mutually assured destruction. For example, if the attacker rolled a 6, 5, 4, 3, 3 and the defender rolled a 5, 5, 5, 4, 3, the attacker would win 1, tie 2, lose 2 – both would lose three units. 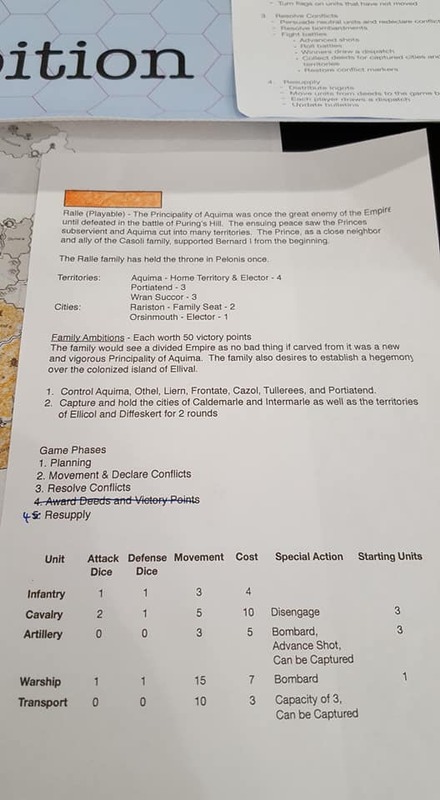 A successful battle (destroy the enemy completely or destroy more units total) gains the the victor a dispatch (special tactics and bonus events). This continues throughout the map until all battles are resolved. The resupply phase is the easiest of all. Place your new troops, collect the income from your territories, and collect a dispatch card. After each turn there are also map-wide events, from illnesses that block certain regions from movement to pirate marauders. It’s a fun game. 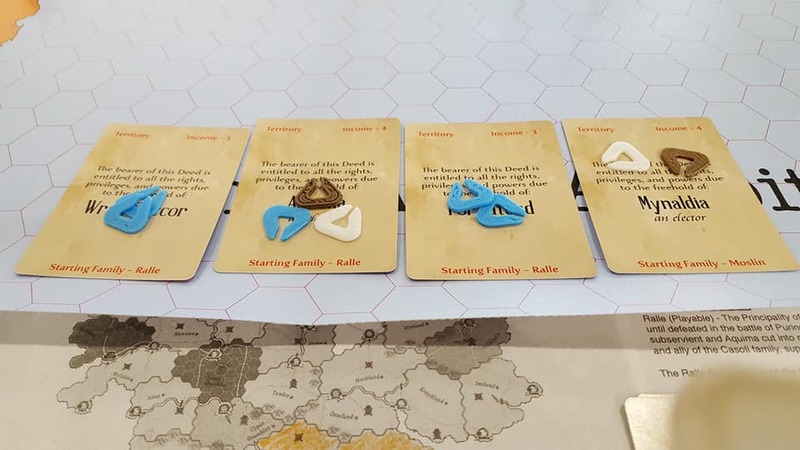 I played twice over the weekend – the first game essentially a three player game with a fourth NPC (he had to leave early). Each player controlled two joined families and picked one of the family goals. We were able to handle eight players worth of troops and finish the game in around three to three and a half hours. A good portion of that was an initial thirty minutes just going through everything. The second time I played was with an actual large group of eight, including a fifteen year old who ended up winning by defeating his father in a pitched battle. Again, after a turn of everyone figuring it out, everyone had down the basics by the second turn. There were questions here and there, but it was all pretty streamlined. Again, counting the basic overview to go over the rules and strategy, it took a little over three hours. It was just as fun the second time and, more importantly for me, there wasn’t a lot of waiting around on other people do do their thing. 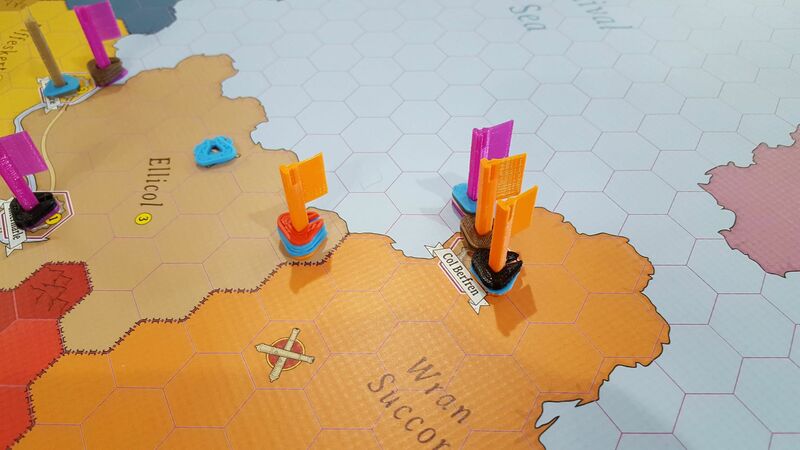 Conflicts themselves are resolved in a minute or so if they’re really complex and it’s easy to jump around the board between multiple players to get things knocked out. It’s obviously still in development, pending a Kickstarter (sometime next year, according to the creator), so some things can change. But in its current form, it’s fun, has a low learning curve, and a high replayability factor. It’s definitely worth keeping an eye on in the coming months.